Hypergraphia—confessions of a compulsive writer. Try the strangely pleasurably act of writing will a dull pencil tip on card. It’s almost as satisfying as writing on a banana with a biro! — one of my collected samples of handwriting. should perhaps be writing this post by hand, as hypergraphia is the overwhelming desire to write, and it’s something I’m pleased to say I have. * I’m something of an obsessive when it comes to handwriting. I have been for as long as I can remember. 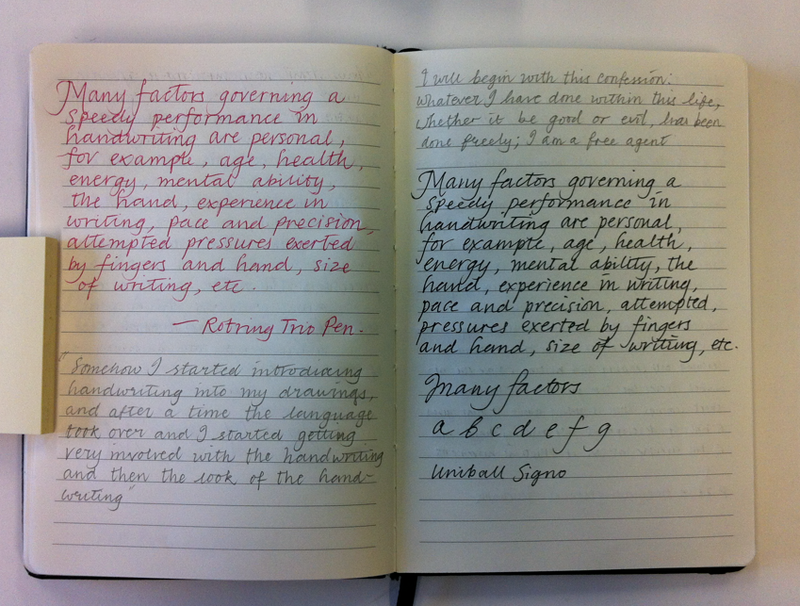 It’s not that my hand is perfect by any means, but I simply love the physical act of writing. For me, writing somehow scratches an itch. And in the same way some people doodle or draw at any opportunity, I spend time writing, using a variety of pens and pencils. In fact I use whatever I have to hand, just to forge the same creative connection an artist has with paints and brushes. When I say handwriting I’m referring to both the natural, generally unforced forms of handwriting as well as calligraphy, whereby letters are formed in a far more self conscious and considered way. Often my attempts result in something that falls between the two. 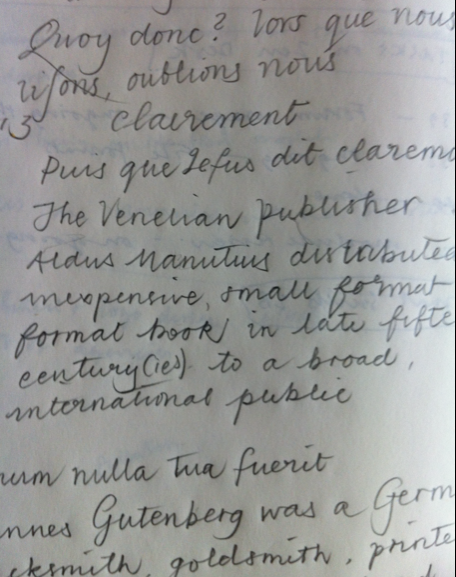 I’m keen to develop my natural handwriting to see how it might improve or evolve, and for several years I’ve made copious amounts of notes kept on scraps of paper and in journals. 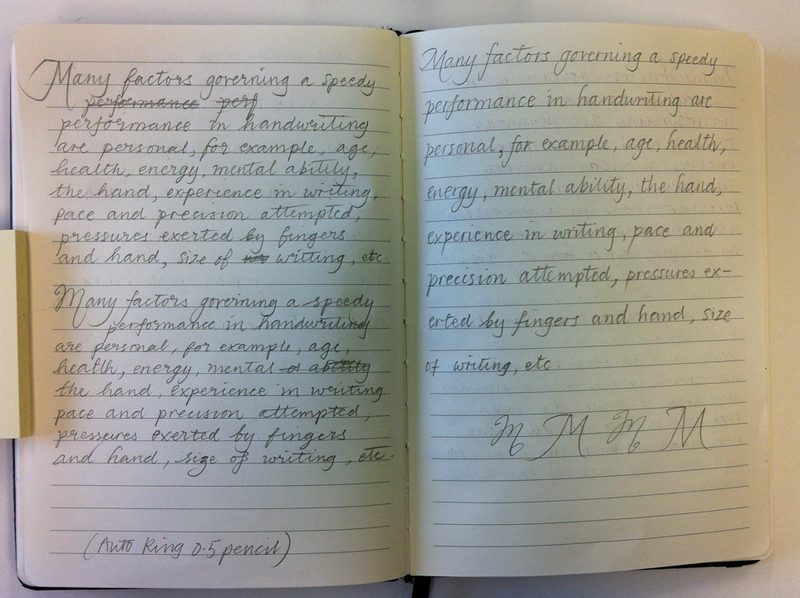 I’ve been experimenting with lots of different writing speeds, implements and surfaces and this yields a range of results, some are markedly different and as a result my writing appears to be developing and even steadily improving. My own hand changes and this is largely dependent upon how much time I have to write, and my handwriting is largely an amalgam of different scripts. 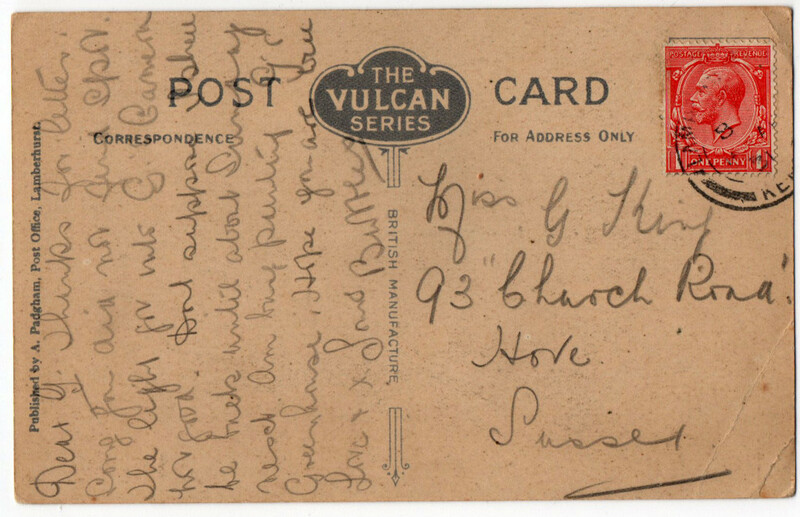 I am influenced by the handwriting of others and even collect samples of interesting hands such as the old postcard above, written with a dull pencil tip. Here you can see some of my scribbles as they come; mistakes and all. Some of the images are my attempts of simply playing with different tools to see what happens. I’m working on some projects at the moment that utilise my lettering and will post the results here in the near future. In the meantime, I’d be interested to see the work of any other hypergraphicists (is there such a word?) who share this obsession. 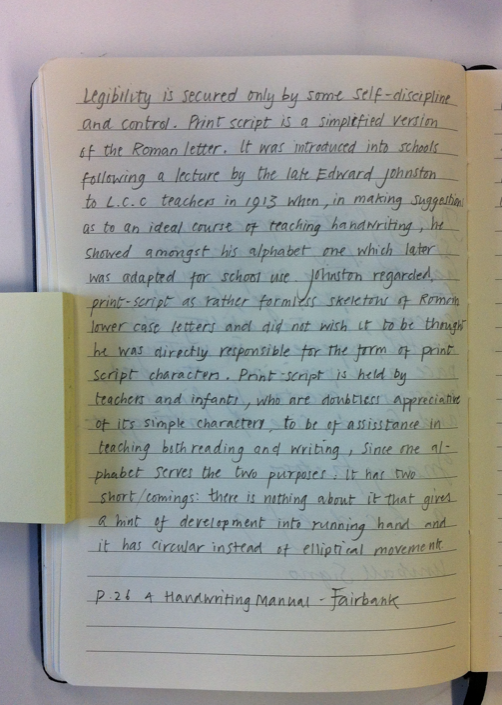 A print script written an average speed. Below: Click the image to link to see my growing collection of scripts on Pinterest. 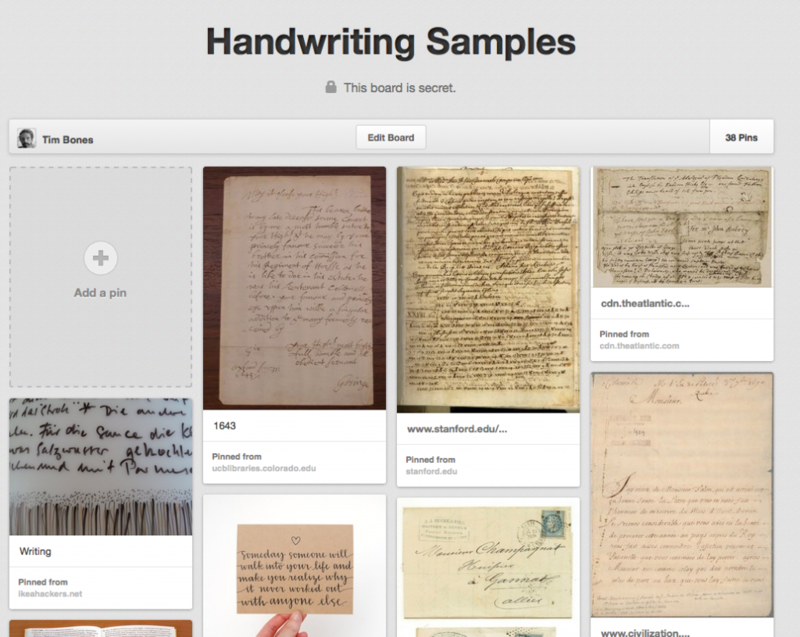 A collection of handwriting samples on my Pinterest page. Click the image to view them. *NB. I use the term hypergraphia loosely. I am aware that this can be a genuine medical condition, sometimes a byproduct of epilepsy and other conditions. However, I use the word here in a playful sense to make a point about my writing fixation. A wee grain of truth?